Southern Air Force base inaugurates newly renovated synagogue. 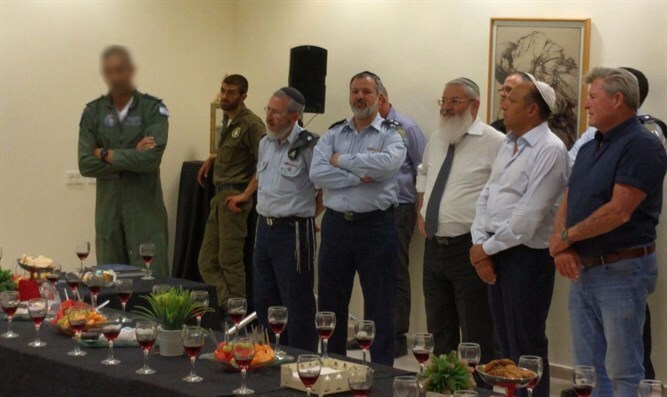 Hatzerim Air Force Base inaugurated its synagogue this week, after renovating the decades-old synagogue. Attending the ceremony were Deputy Defense Minister Rabbi Eli Ben-Dahan (Jewish Home) Hatzerim Air Force Base Commander Avshalom Amosi, and Association for the Wellbeing of Israel's Soldiers Chairman Yoram Yair. The synagogue was renovated thanks to Mexico's Yitzhak Assa, who attended the ceremony with his entire family. The newly renovated synagogue will be called "Shaar Binyamin" after Assa's parents Binyamin and Rivka. Last year, Assa donated a Torah scroll to the synagogue. "The key to fighting for the State of Israel and protecting its citizens is our faith in the correctness of our path," Rabbi Ben-Dahan said. "The synagogue is a spiritual place from which we draw great emotional strength." "I thank the Assa family from Mexico for strengthening the spirit of our soldiers."